Even though he is tackling a shorter distance after winning the Singapore Derby (1800m) two months ago, JUPITER GOLD still proved too good in a division of the Kranji Stakes A event over 1200m on the polytrack at Kranji this evening. Ridden by his Derby-winning partner Olivier Placais, the son of Congrats came from off the pace early to beat BIRAZ by a head for his ninth win in 22 starts. "I’m very happy he’s come back after the Derby over a distance I thought would be too short tonight," said trainer Hideyuki Takaoka. "We’ll see how he pulls up, but the Raffles Cup (on Sep 23) should be his next race now." "From the start when he jumped, I knew he would win, even if he was coming back from 1800m to 1200m," said Placais. "He’s amazing. He’s a horse that can follow any pace. He actually showed some speed early but I was happy to drop him back." 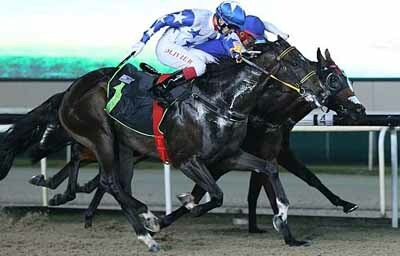 JUPITER GOLD actually started favourite tonight despite going over 1200m.